The Montpelier Plantation Inn is built on a former sugar plantation estate in the Caribbean island of Nevis. It is a strange feeling following in the flip-flop steps of royalty. And swimming in the same palm-fringed pool in which Lady Diana displayed her breaststroke and the boys learned to ‘bomb’. Although I doubt the resident labrador didn’t sink his teeth into their beach ball and puncture it as it did ours. In 1992, Diana, Princess of Wales stayed with the young princes at the exclusive Montpelier Plantation Inn on Nevis when her separation was announced. The ‘boutique’ plantation inn offers eight bungalows and 17 guest rooms and has its own private beach, ‘Pinney’s’, 10 minutes away. The estate goes back to 1687 and the inn has been run by the Hoffman family since 2002. 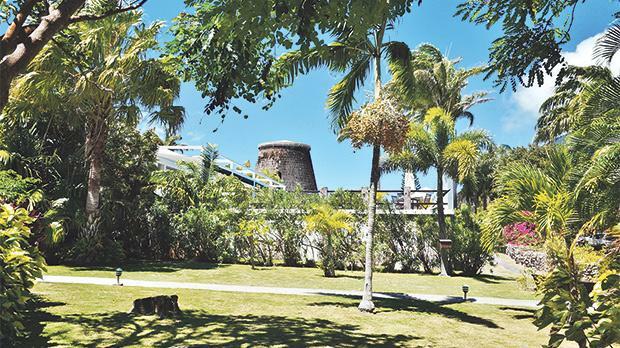 It also boasts a function room in an old sugar mill and, in ‘750’, has one of the best restaurants on the island. The Indigo Lounge Bar may very well be where William and Harry developed their taste for ‘molecular cocktails’. The luxury boutique hotel is surrounded by plush grenery. There are four other plantation inns on Nevis. The 10-acre Old Manor House offers rooms in a former hospital, forge and smokehouse and you can enjoy afternoon tea and the trade winds on the terrace. The Nisbet Plantation Beach Club is famous for its 18th century Great House and avenue of palms going down to the sea. It is named after Fanny Hamilton nee Nelson’s first husband, Josiah. The main house of the Hermitage is the oldest wooden house on the island and perhaps the oldest wooden house in the Caribbean. The sitting-room dates back to 1670. “Our family discovered this old house in 1971, when it was little more than a ruin lost in the bush, when there were more people on the island riding donkeys than driving cars and the electricity went off every afternoon at 4 o’clock,” says the owner, Richie Lupinacci. His family originally came from Pennsylvania. The Hermitage is surrounded by mango trees (brought from India in the early 1700s), breadfruit (brought from Tahiti by the British to feed the slaves who rejected it when it was then used to feed pigs), night blooming cereus, royal palms, coconut trees and tamarinds, as well as flamboyants, the national tree of Nevis and St Kitts, sister island to Nevis, only a short ferry ride away. Nevis is as friendly a Caribbean island as you can find. Everyone sweet talks you. Having introduced me to an elderly cannon followed by an outsized lobster sandwich, two hummingbirds and some wild monkeys, Pam Berry unashamedly sugar-coated her favourite Leeward island. 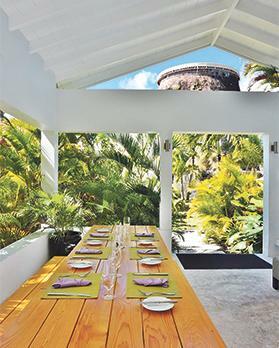 Berry is an expert on the 100-acre Golden Rock Plantation Inn on Nevis, one of Leeward islands off Antigua. The land in Gingerland was originally purchased by her family in 1801. She visited the island for the first time from Philadelphia in 1963 and took over the hotel in 1975. And sold it to New York artists Brice and Helen Marden. “Our reception area is the old counting house where they counted the hogsheads. It goes back to 1801. The Drip House is where they purified the water. You can stay in our sugar mill suite. You can be part of history in any plantation. 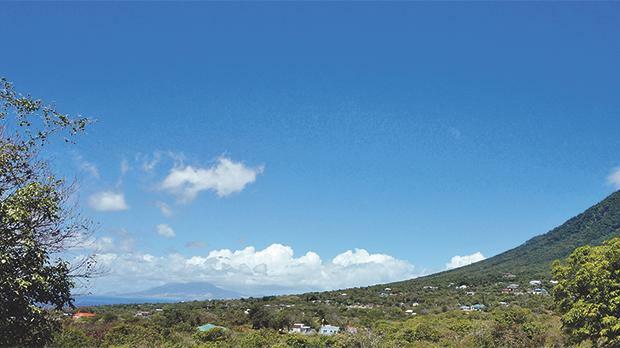 View of the Caribbean island of Nevis and the Nevis volcano peak as seen from the Montpelier Plantation in the Federation of St Kitts and Nevis. If they are not talking about sugar, the Nevisians talk about Horatio Nelson. He arrived as captain of HMS Boreas in 1785 and spent two years enforcing Britain’s Navigation Acts, which were intended to keep its colonies trade exclusive to the mother country. He had a lookout at Saddle Hill. Nelson Spring provided his fresh water. He attended a ball at the Bath Hotel, the first tourist hotel in the Caribbean. Unsurprisingly, Nevis also has a Nelson Museum. One of the exhibits is a scrap of the Union Jack flag from ‘The Victory’. On March 11, 1797 Nelson married Frances Fanny Herbert Nelson under the silk cotton tree, a short stroll from the Montpelier Plantation Inn. Fanny, a young widow, was the niece of the owner of the Montpelier sugar plantation. The future William IV gave the couple away. St John’s Fig Tree Church holds their wedding licence. Nelson left the island in 1798 and the couple separated in 1801. As yet, there isn’t an an all-inclusive ‘Admiral Nelson Resort’. Or a Horatio honeymoon ‘hideaway’ offering generous high season discounts to people with one eye and half an arm. However, a ‘Lady Di Suite’ might be in the pipeline.